Armed pro-government militia members flash victory signs as they occupy the Monimbo neighborhood of Masaya, Nicaragua, July 18, 2018. 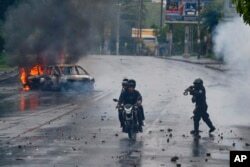 A United Nations report released Wednesday on four months of unrest in Nicaragua describes a comprehensive repression effort by the government that extends from the streets to the courts. A police officer aims his shotgun at two men riding a motorcycle during a protest against Nicaragua's President Daniel Ortega in Managua, May 28, 2018. The U.N. team reached its conclusions despite government obstacles thrown in its path. Team members could not access relevant government agencies or observe court hearings for those accused of crimes ranging from organized crime to terrorism for participating in the protests. When the team attempted to travel outside the capital, the foreign ministry forbid it for security reasons. “This decision is humiliating, it doesn't give us justice. Because we know that these guys didn't kill my husband, that those who really did it are riot police, because there are videos indicating it, that my husband was surrounded by police,” Sandoval said.